Add lukewarm water, honey, and instant yeast to a liquid measuring cup and mix. Let sit for approx. 10 min. Add flour to the bowl of a stand mixer. Add yeast-water mixture and knead for approx. 5 min., or until well combined. Add salt and butter and knead for approx. 5 min., or until well combined and firm. Flour a work surface and form dough into a ball. Transfer to a clean bowl and cover with a damp kitchen towel. Let rise in a warm place for approx. 1 hr. Flip dough over and let rise for another approx. 1 hr. Preheat oven to 175°C/359°F. Punch dough down, remove from bowl and divide into 6 equal pieces. Roll into smooth balls and let rest for 10 min. Afterwards, roll out every piece of dough into approx. 35x12-cm/14x5-in. rectangles. Fold one long side in to the middle of the rectangle, then fold the opposite long side over to meet it and pinch the fold all the way to seal it. 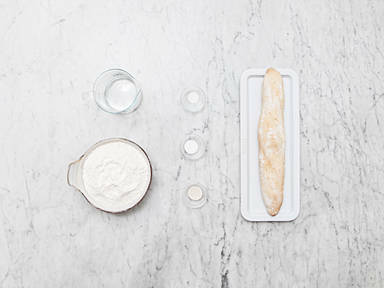 Gently roll the dough into a long, thin rope and transfer to a baguette pan. Score on the diagonal and transfer to the oven. Spray baguettes with a bit of water and bake for approx. 12 – 15 min. at 175°/350°F. Enjoy!